En route Hallo Velo ! Hallo Velo ist the first bike messenger cooperative in the french speaking part of Switzerland. This project ended successfully on 15/4/2016 19:00! You’ll get a wonderful personalised email to thank you with the picture of the day – especially for you! You’ll get the brand new Hallo Velo cycling cap – spring collection 2016. You’ll get the brand new Hallo Velo cycling cap – spring collection 2016 – our team badge and your name will appear in the next HV episode. You’ll get the brand new Hallo Velo cycling cap – spring collection 2016 – our team badge and a compilation of strips about some messenger worklifestyle stories. You’ll get the brand new Hallo Velo cycling cap – spring collection 2016 – our team badge and 3 deliveries in Geneva city. You’ll get the brand new Hallo Velo cycling cap – spring collection 2016 – our team badge – an helpfull shopping bags transportation in Geneva region. You’ll get the brand new Hallo Velo cycling cap – spring collection 2016 – our team badge – an helpfull packages transportation like for a moving up in Geneva city. You’ll get the brand new Hallo Velo cycling cap – spring collection 2016 – our team badge – your name will appear in all of the next HV episodes – an unforgatable and tasty lunch for 5 by the Messenger Canteen in Geneva. You’ll get the brand new Hallo Velo cycling cap – spring collection 2016 – our team badge – a genuine homemade Comic strip about messenger’s truly lived stories and an unforgetable and tasty lunch for 5 by the Messenger Canteen in Geneva. You’ll get the brand new Hallo Velo cycling cap – spring collection 2016 – our team badge – an unforgetable and tasty lunch for 5 by the Messenger Canteen in Geneva – and a champagne apero delivered by us within Geneva. For out-of-towners: SURPRISE! 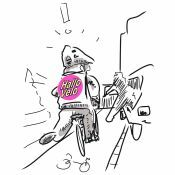 Hallo Velo is the first bike messenger cooperative in the french speaking part of Switzerland. The project, launched in december 2015 by a group of friends and bike messengers, is working for and towards a local and social economy that relies on the values of solidarity.